Before we get any deeper into this review, it’s important to note that, aside from the cameras they carry, both Mavic 2 drones are identical to each other in terms of specs. As such, whenever we refer to a feature that isn’t camera-related, you can safely assume that said feature is present on both the Mavic 2 Pro and Mavic 2 Zoom. To be perfectly honest, the Mavic 2 series isn’t a massive improvement on the original Mavic Pro when it comes to raw flight specs. The drones can stay airborne for a couple minutes longer (31 instead of 29), and can fly a few miles per hour faster (44 instead of 40) than their forebears — but that’s about it. The most significant improvements are the Mavic 2’s software, sensing abilities, and cameras. Really, the Mavic 2’s only card-carrying competitors are other DJI drones. On the software side, the Mavic 2 ships with DJI’s new ActiveTrack 2.0, which allows the drone to follow moving subjects autonomously, and with more precision than ever before. Additionally, both the Pro and Zoom are equipped with OcuSync 2.0: the latest version of DJI’s video transmission technology, which allows you to see what the drone sees in real time — now in full 1080p. DJI has also outfitted the Mavic 2 series with a drastically improved environmental sensing system. 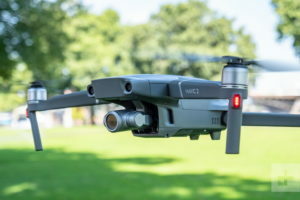 Whereas the original Mavic Pro only sensed obstacles in front of it (and the Mavic Air added behind and down), the second generation boasts omnidirectional sense-and-avoid, thanks to 10 sensors positioned on its front, back, left, right, top, and bottom. Last but not least, the Mavic 2 boasts one of two new cameras. The Mavic 2 Pro carries an integrated Hasselblad camera with a 1-inch CMOS sensor and adjustable aperture, while the Mavic 2 Zoom boasts a smaller 1/2.3-inch sensor, as well as the ability to zoom from 24mm to 48mm. We’ll delve deeper into the camera specs later. All things considered, the Mavic 2 line is definitely more evolutionary than revolutionary — but in this case that’s a good thing. It appears that DJI kept all the things that worked well in the first-generation Mavic drones, and only worked on areas with significant room for improvement. We appreciate that. There were a lot of good things going on in the original Mavic, and we’re glad DJI didn’t try to fix what wasn’t broken. When it comes to design and build quality, the Mavic 2 line is an apple that hasn’t fallen far from the proverbial tree. In other words, it’s built like a brick outhouse. The original Mavic Pro is one of the sturdiest, most well-built drones we’ve ever flown, and the Mavic 2 series is no different. In terms of form, not much has changed. The Mavic 2 series looks and feels nearly identical to its older siblings, save for a few minor changes. This generation is slightly larger and heavier, and also has a few more sensors built into its hull — but that’s where the differences end. Thankfully, the new fleet still has the same awesome folding-arm design and rock-solid construction. We didn’t crash our test units this time, but due to our extensive experience with the first-generation Mavic (which is substantially similar in terms of build quality) we’re confident that both the Pro and Zoom could barrel into bushes, bump into branches, and bounce around in your backpack — and live to fly another day. DJI says that the Mavic 2 can hover for 29 minutes in optimal conditions, and thanks to its aerodynamic design, can stay airborne for a maximum of 31 minutes if flown at a constant 7 miles per hour (25 kph). As usual, these stats were achieved in conditions that you’re highly unlikely to encounter in the real world — so we ran both drones through our own series of endurance tests to get a better read on the Mavic 2’s true flight times. The first of these was a static hover test, where we let both drones hover in place until they drained their batteries and automatically landed themselves. Our two hover tests lasted an average of 28 minutes and 14 seconds — which isn’t very far off from DJI’s claimed 29 minutes.. When it comes time to recharge, you can expect about 45 to 50 minutes to juice up each battery from empty to full — which is slightly quicker than previous generations. In the air, the Mavic 2 feels almost exactly the same as its predecessors — and by that we mean it’s tight, athletic, and supremely responsive. If you’ve ever flown a DJI drone before, you’ll feel right at home with the Mavic 2. Hell, even if you haven’t flown a DJI drone before, you’ll still be able to fly this one like a pro. DJI’s flight software is top-notch and extremely reliable, so the Mavic 2 only goes where you tell it to go — no drifting, wandering, or slippery controls. To borrow a phrase we’ve used in the past: These drones are practically bolted to the sky. These stellar manual controls are just the tip of the iceberg, though. Thanks to the Mavic 2’s beefy omni-directional obstacle avoidance system, you can fly these drones with more vigor and confidence than ever before. If you’re about to crash into an obstacle, DJI’s software will beep and alert you as you approach. If you ignore these warnings and keep flying, the drone will even auto-brake to avoid a crash. It’s worth noting, however, that this only works from the front, back, top, and bottom of the drone. Unfortunately, the left and right sensors are only switched on when you’re in ActiveTrack mode and the drone is flying itself. Still, even with sideways sensing disabled during manual flight, both Mavic 2 drones feel extremely safe and reliable. You really have to go out of your way to crash them — and that kind of in-air confidence is ultimately what helps you get better footage.